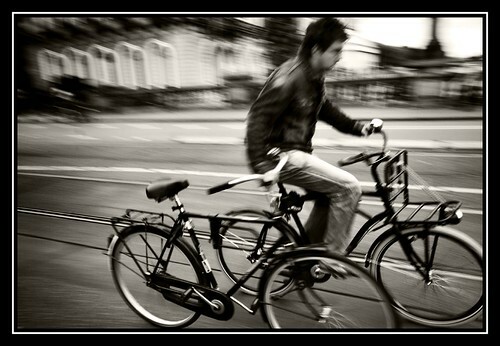 Another classic Copenhagen sight - although this very cool guest photo is taken in Amsterdam by alfonstr. Sometimes you just have to get two bikes from one place to another. When my one bike is finished at the bike repair shop, I ride my other bike down to pick it up. The quickest way is pictured above. All taxis in Copenhagen, however, carry bike racks in their boot [trunk] so you can always get a taxi home if you have a flat tyre or you're drunk or it's raining and you don't want to get your €1000 Hugo Boss suit wet. There is room for two bikes on the rack and it costs 10 kroner extra per bike. But as mentioned, you could just ride both bikes home in a flash.